If you're passionate about free software, the Free Software Foundation wants you to be a part of LibrePlanet 2014. We're excited to announce three new ways to get involved in next year's conference: answer our Call for Sessions, apply to join our Exhibit Hall, or join our new Volunteer Committee. We are now accepting applications for each one of these exciting ways to be a part of this annual gathering for free software advocates, contributors, and users. LibrePlanet is the annual conference of the Free Software Foundation and will be held in March 2014 in Cambridge, MA. This year, the theme of LibrePlanet is "Free Software, Free Society." How can free software protect journalists, whistleblowers, activists, and regular computer users from government and corporate surveillance? How can free software, or free software values like copyleft, community development, and transparency, be used by people fighting to create free societies around the world? What challenges are standing between us and our goal of free software ubiquity? 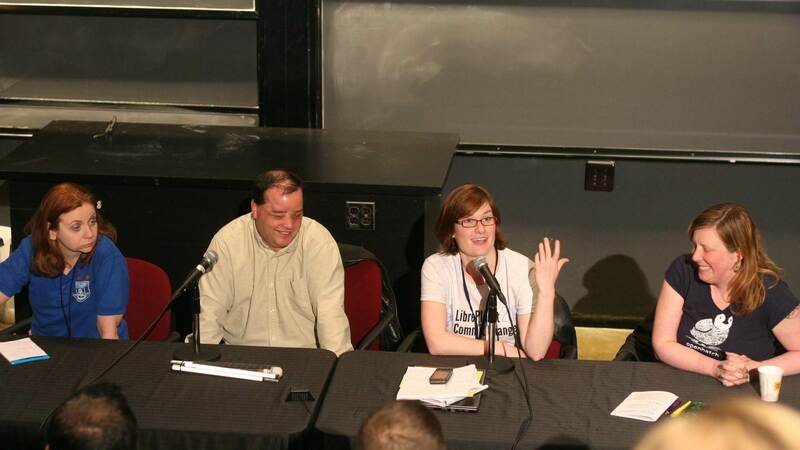 With your help, we'll tackle these questions and more at LibrePlanet 2014. All associate members of the FSF may attend LibrePlanet gratis. Be sure to join our announcement list to be the first to know when the conference dates and venue are officially announced! We invite presenters of all kinds and experience levels to submit applications during our call for sessions; you don't have to be a coder to speak at the annual conference of the Free Software Foundation. Free software users, activists, academics, policymakers, developers, and others are all encouraged to help us build our most vibrant program yet. Applications are due by 22:00 UTC (17:00 Eastern time) on November 15, 2013. There are four types of sessions: Solo presentations, panels, workshops, and strategic action sessions. Details about the different types of sessions can be found in the application form. There is also a place on the proposal form to indicate if you would like to participate in the conference in other ways – by framing and moderating a panel, facilitating a caucus space, sharing media-making skills, or blogging about the conference. Please let us know about the community-building skills you have to share! Finally, if you are not interested in submitting a proposal, but would like to share a quick idea for a workshop, topic, or a speaker you’d like to see at LibrePlanet, please let us know your thoughts on our conference brainstorm page. Remember, submissions are due by November 15! Submit yours today! Another first this year is a formal volunteer planning committee for LibrePlanet. This conference is about celebrating a movement built by dedicated volunteers, and we feel that our community should also have a hand in developing the conference program, logistics, social events, and outreach. The LibrePlanet volunteer committee will meet approximately monthly between now and LibrePlanet and will assist FSF staff in many aspects of conference planning. If you have ideas or skills that you think would help make LibrePlanet even better, consider joining us! Sign up today, and join us for the first meeting on Monday, October 21, 2013 at 6:30pm (22:30 UTC) in the FSF office (51 Franklin Street, Fifth Floor, Boston, MA). Applications for the volunteer committee are due by 22:00 UTC (17:00 Eastern time) on November 15, 2013. LibrePlanet is the perfect place to spread the word about your organization to an inspired and engaged audience. We have two kinds of promotional opportunities for LibrePlanet 2014: exhibit tables and sponsorships. Exhibit tables will be located in a highly visible primary thoroughfare. Your table and program ads will reach hundreds of software developers, free software activists, academics, students, and computer users. The deadline to apply for an exhibit table is 22:00 UTC (17:00 Eastern time) on January 31, 2014. To inquire about sponsorship opportunities, including mention in our online and print program as well as a verbal thank you at the event, please contact campaigns@fsf.org.